After my brother and I had left my beloved Baghdad on September 6, 2007, we arrived in Damascus and then Aleppo by motorcars. Many Iraqis were leaving Iraq to escape the worsening security conditions. Their departure from Iraq was hastened after Damascus had announced that it will apply to the Iraqis who enter Syria a new regime of previously getting visas from September 10, 2007. In Aleppo we stayed at my older aunt's house for ten days. My aunt is the only alive among her sisters after my mother and my youngest aunt had passed away last July. Finally, we took the plane to my beloved Yerevan, the capital of the Republic of Armenia, which we arrived in after midnight. In the first month I rented a house in Komitas Street, a street of vital importance in the capital, and then moved to live in a house in Kievian street. I have begun a search to buy a house. My sister s youngest daughter, who came from the United States to continue her study at Yerevan State Medical University, lives with me. Her study was interrupted at the College of Medicine, University of Baghdad, after my sister and her family had left Baghdad in July 2006 and emigrated to the United States. They left Iraq because of the insecure conditions prevailed in the country and after terrorists began targeting and threatening the life of Iraqi scientists, engineers, academic staff members, doctors and surgeons, among whom my brother-in-law. First, I had to place my sick brother in the hospital to be under continuous medical care. I keep visiting him at the hospital to be reassured and watch his condition. I began working as a supervisor engineer in building roads and bridges in a site of the project placed near the Victory Park and Monument region, which symbolizes the fiftieth anniversary of declaring the Soviet Republic of Armenia (declared on December 2, 1920). The network of roads and bridges in the project I work will connect Hiratsi, Saralanj and Avetisian streets in a high place that overlooks the capital Yerevan. From this place, the fascinating scene of Ararat mountain (also called Masis by Armenians), which historically symbolizes Armenia and Armenians and is captivated by Turkey, clearly appears, especially in shining days. The two peaks of the mountain appear close to us, although they are at 55 kilometers from Yerevan. The work in the project, which extends for kilometers, continues earnestly and actively to a late hour of the day to compensate for the breaks that may occur during the season of bitter cold, snowfall and torrential rains. The project is funded, as well as several other projects to reconstruct Armenia and NKR (Artsakh), by Lincy Armenian American Foundation. I stand in honor and respect for this foundation and its great work, which contributes, beside other domains, to building a network of modern roads and bridges. This eases connection between different parts of the capital, as well as provides jobs to thousands of workers and engineers. I am happy and proud to be one of the engineers who contribute, even in simple part, to reconstruction of my beloved Yerevan, after I had contributed to reconstruction of my beloved Baghdad in the past. I regard this as one of the events I am proud of in my life and career. Before leaving Iraq a friend of mine, who lives in the United States, found, without asking him to do so, a job offer for me to work as a construction engineer in the United States. Ahead of that a friend settled in Canada promised to aid my immigration to Canada. However, I apologized to accept both offers as I have the great wish to live and work in my beloved Yerevan to make true the dream I have since childhood. Among the difficulties I faced in work at the beginning was the different method used in putting engineering designs and its language. It depends, sometimes, on the Russian language commonly used in Armenia, for being one of the republics of the former Soviet Union. The Russian is widely used by engineers and workers belonging to the old generation. I begun learning some Russian words used in work and other spheres of life and to acclimatize with the work and its mountainous environment, which varies from the working environment in Baghdad. Perhaps I am the first Iraqi construction engineer, in the recent years, who enter such a domain. It also needs mastering the Armenian language (with its eastern dialect used in Armenia, other republics of the former Soviet Union and Iran) to be able to write reports on the progress and amounts of the work. The engineering supervision here is less strict than that we were familiar to in Iraq because of what I was told it is continuing of the system existed in the Soviet era. I try to apply a more strict supervision system to the project I work in cooperation with my colleagues in work. Close to this project there is the project to build Cafesjian Museum of Art oversaw by Cafesjian Armenian American Foundation beside a project to build a museum and a home to the French Armenian world-famous singer Charles Aznavour. Then, I was appointed a supervisor engineer to another part of the project beside a stone bridge built in 1933 in the era of the Armenian communist leader Aghasi Khanjian. He was a victim of a liquidation campaign led by the Soviet leader Stalin in the third decade of the last century. This bridge is placed in the Street of Alexander Miasnikian, the first communist leader of the Soviet Armenia. The manager of the company I work in told me I was appointed to work in this important site of the project because of the serious nature of my work after less than a month of work in the project. The work in this site is carried out by a contractor whose family immigrated, while he was a child in the age of six months, from the Iranian city of Isfahan to Armenia in 1946. The contractor, who is loyal to his work, has made me a striking offer; he has asked me to work with him in Iraq in engineering projects and compensate for the house I sold in Baghdad before leaving it. This means, in case of existing the proper conditions to achieve it, my return, even temporarily, to my hometown and beloved Baghdad. Some workers and engineers confuse that I am from Iran for similar vocalization of the words (Iraq) and (Iran) in the Armenian language (also in English). To prevent such confuse, I say I am originally from Baghdad, Iraq. Workers often ask me about Iraq, its situation and ethnicities, including Kurds and Yezidis, 55-60 thousand in Armenia, who consider Iraq as their historical homeland. Many Yezidis are meat merchants in Armenia. The overseer of the workers, had passed three years in Adan, Yemen, in the eightieth of the last century. He always remembers with yearning those days and tells me the customs and traditions of Yemen s good-hearted people and comes near to me whenever I hear Iraqi songs on my cellular phone!! I used to arrive to Yerevan s streets and regions by using a detailed computer map and guide for transport minibuses. I learned many names of avenues and streets of the city in a way that made some friends and work colleagues jealous!! I used to spend the daily break hour close to my workplace in a region where many universities and institutes exist near the metro station named (Youth). I used to sit near the statue of the great Armenian poet Avedik Isahakian (1875-1957) which overlooks the street of great Armenian writer Khachadur Abovian (1803-1848). I used to sit down in this site and enjoy looking at cars and pedestrians, mostly young men and beautiful and elegant women remembering the Armenian famous song titled the beautiful girl of Yerevan (Yerevani sirun aghchig) !! I know well that I would made jealous my male readers, especially Armenian young men in the Diaspora!! Why not, when I myself envy myself every day for living in my beloved Yerevan!! The city streets witness crowds and traffic jams for launching a campaign to build roads and bridges which people here link to the presidential elections to be set up in next February. I met in Yerevan some friends whom I knew by Internet while I was in Baghdad. They are nice and help me to overcome difficulties I face here. Among those an MA student who presented a dissertation on the conditions of Iraqi Armenians after the US-UK invasion of Iraq in 2003 presented to the Graduate School of Political Science and International Affairs of the American University of Armenia. The research caught the attention of Iraqi Armenians, international and humanitarian organizations working in Armenia, because it focuses, in particular, on the conditions of Iraqi Armenians in Armenia and proposes solutions to their problems. The student had contacted me by Internet while I was in Baghdad, on the advice of some Iraqi Armenians in Armenia, to supply her with information she needs in this difficult subject, which lacks written sources. The faculty adviser is the political scientist Dr. Armen Ayvazian(2). The student has completed, by her hard work, a distinctive research, which is the first of its kind in Armenia and moved from research to humanitarian act to aid Iraqi Armenians in Armenia. 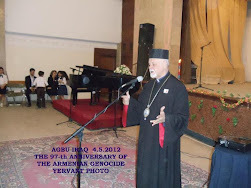 I attended a meeting of Iraqi Armenians in Armenia in which nearly 120 Iraqi Armenians settled in Armenia were present. The meeting was aimed at setting up a union or league which would represent and follow the affairs of Iraqi Armenians in Armenia in front of the government and the public, international and humanitarian organizations working in Armenia. An Iraqi atmosphere prevailed the meeting in which the attendance exchanged ideas and thoughts on setting up this union and its aims. The meeting unanimously adopted setting up this union which needs to put its rule, gain official approval and elect its board of directors. It's so great to hear from you, from Yerevan. We're praying that the situation in Iraq would settle down, as well as the situation here in Lebanon.